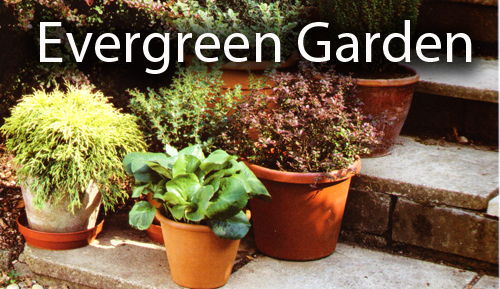 Evergreen garden plants come in many shapes, sizes and shades. 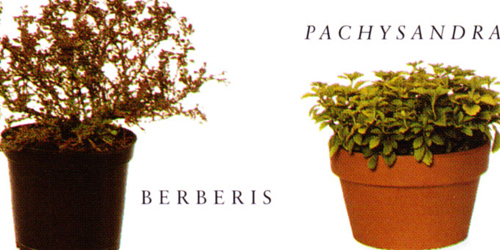 Grouped in #containers they will provide you with year round interest and color. Include some golen or variegated foliage among your evergreens and choose contrasting leaf forms to make a striking group. Plant any time of year. Crocks or similar material for drainage. Equal mix loam based compost and container compost. Large shrubs such as this conifer, should be potted into a large container. Place plenty of crocks or drainage materials at the base of the pot drain hole. If the plant is at all potbound, tease the roots loose before planting in a new pot. Fill around the rootball with compost pressing it down firmly around the edges of the pot. Smaller plants like the bergenia should be planted in a pot slightly larger than the existing one. Place crock pieces in the bottom, position the plant and then fill around the edges with compost. Repeat with remaining plants. Plants will stay moist longer if they are stood in saucers of wet gravel. This group of plants will do well positioned in partial shade. Water regularly and feed with slow release plant food granules in the spring and autumn. Read more.....Let's grow lettuce in garden bowls.